I have never known a kinder soul than my own mother. I lost my mom last year around this time; a month before Mother’s Day to be exact. April 2016. It’s been very hard to talk about and something I never share professionally, because it is so personal and close to home. I look back on those last moments with my mom, as hard as they were, and cherish every single second I had with her. And until she took her very last breath, she embodied true KINDNESS. Those words echo fervently in my head. I can see her so clearly expressing her honesty to me as a child. Naturally, as a young adult, I left home as early as I could to start my life and career. Every time I returned for a visit, I would take my mother for an afternoon tea so we could just talk and spend time together. Thinking back on those conversations now (and what I wouldn’t give to have just one more with her), I can’t help but smile because these were the very moments that I got to KNOW my mom. It was like meeting her for the first time, as an adult. She was her own person, her own being, who just happened to share her genes with me. If there was only one word I could take away to describe this woman I had come to know was KIND. Leading up to her last days, I distinctly recall the generosity and kindness she showed to the nurses who cared for her. She would look at each of them deeply and say, “Honey, you’re so beautiful!” She was always so sweet to everyone she met, even in her darkest hours. She embodied this virtue that I believe is nothing short of miraculous. I’m now a mother myself. My son Brom turns nine this year and he loves video games, swimming, and visiting Legoland. He just learned to ride his bike without training wheels and now we ride together on the weekends. My most special moments with Brom are at bedtime. It’s the time of day when we all wind down, it gets a little quiet, and we get to just talk. He tells me about his day and asks me questions. He’s at the age where he’s starting to wonder more about me, about who I am as a person. He understands that I’m someone beyond “mom” and he wants to learn who that is. It makes me so happy to get to connect with him on that level already. We really get to bond at bedtime and it’s quickly become my favorite part of the day. This Mother’s Day, we’ll probably get breakfast together as a family (since that’s our collective favorite meal) at our favorite spot, Breakfast Republic. Bike riding is still new and exciting, so I expect we’ll go bike riding at Crown Point. But mostly we’ll celebrate the holiday by being together. I wish all the mothers out there, mine included, a HAPPY MOTHER’S DAY! Life is short, and I’ve learned not to take anything for granted. I hope you treasure the special moments you have with this incredible woman in your life, who blessed you with so many gifts of kindness. She's the smell of certain foods you remember, flowers you pick and perfume that she wore. She is the sound of the rain that lulls you to sleep, the colors of a rainbow. A mother shows every emotion ... happiness, sadness, fear, jealousy, love, hate, anger, helplessness, excitement, joy, sorrow... and all the while, hoping and praying you will only know the good feelings in life. She's the place you came from, your first home, and she's the map you follow with every step you take. She's your first love; your first friend, even your first enemy, but nothing on earth can separate you. Not time, not space...not even death! It’s always such a pleasure to have our work featured in magazines. Last month, our very own LaVonne Crawford spoke with FINE Magazine for their special wedding issue. In the interview LaVonne, the owner and lead designer at Adorations Botanical Artistry, touches on how she helps brides choose flowers and décor for their ceremonies. When composing a floral arrangement, factors such as season, color, price, and client personality are the most important to consider. Specific blooms and color combinations will fit certain brides and their tastes better than others. For example, orchids have an air of modern luxury in their simple, delicate silhouettes, and will typically fit a bride with contemporary style. Price and season, however, are perhaps the trickiest things about creating the perfect arrangements for each bride. LaVonne recommends staying flexible and being open to substitutions. Substituting budget friendly flowers for some of those trendy luxury blooms is definitely going to ease the spending limit a bit, and really maximize a budget. Season is an important factor that affects price, since importing out-of-season flowers can drive up cost. Garden roses are an example of an elegant substitution. They’re as big and fluffy as luxury peonies, but are grown year-round here in California, so they are always available to fill out an arrangement beautifully and can be a better price. It’s helpful that garden roses are especially popular with brides right now, as well; many women can achieve the same trendy looking floral design for less. Choosing flowers in bloom locally at the time of her wedding day is a good strategy to have more flowers for her budget. Speaking of trends, LaVonne was excited to talk about her favorite floral trend right now—greenery! Abundant stems of greenery in an arrangement helps a design feel more natural and organic. Bouquets look more like they might in nature, with bold leaves and crisp ferns, stark branches and wispy stems. Not only does it make a floral design feel true to nature, it also adds elbow room in a floral budget. Greenery tends to be less expensive than luxury blooms, but can be just as vibrant and beautiful. Now that we’ve mentioned how to save on wedding florals, we can’t forget doing so lets us splurge a little! LaVonne advises brides to focus flower budgets on the special spaces the couple will inhabit on the wedding day. For the ceremony, go big with flowers at the altar, where everyone is looking, and on the bridal bouquet, where so many photos will focus. During the reception, ensconce the sweetheart table in florals for a dreamy look. These areas will be photographed most, and personally experienced by her, and she can enjoy her beautiful floral arrangements for years to come. Ultimately, we want to understand every bride and client we meet. LaVonne prioritizes personality over preferences based on fads, because in the end, the flowers we create should be a lasting personal expression for each unique client. We’d like to thank FINE Magazine for the delightful feature this month. The article is available to read online now. Vendor Love: Paula Luna Photo. Kelsey and Faryar were married in a beautiful ceremony at Rancho Valencia, coordinated by Suzanne Duffy of Crown Weddings, with an elegant classical style perfect for the venue. Kelsey is a woman of refined tastes, who knew going in just what she wanted. The most important aspect of the wedding to Kelsey was flowers, and her favorite, the one she most wanted to have, was the coral peony seen throughout the classical arrangements reminiscent of Victorian era floral design. 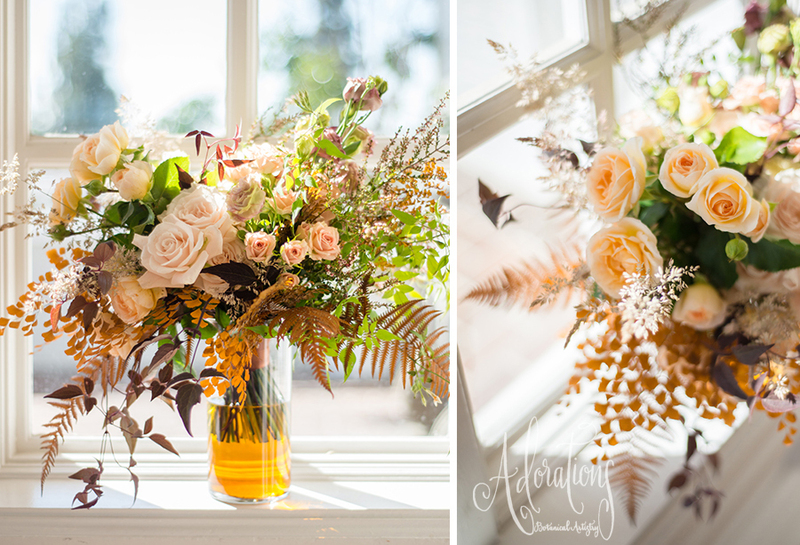 Kelsey wanted a dreamy, blissful feel for her wedding. Suzanne helped her with every aspect of her vision, perfectly integrating it with the landscape and architecture of the resort, which lent just the right touch of natural elegance and old world charm to frame the event. The ceremony featured beautiful arrangements in Victorian plaster urns on pedestals to adorn the aisle entrance. The trellis was laden with peonies, garden roses, and dahlias, interspersed with tendrils of jasmine vine and whimsical butterfly bush blooms to lend a natural garden feel. The bouquets were of luxurious ruffled peonies and Juliette garden roses collared in soft dusty miller all wrapped in fine silk ribbons. Suzanne chose lovely linens from La Tavola Linens, as a pallet for arrangements of garden roses touched with ranunculus for luxurious compositions striking just the right balance between structured and loose design set amidst glowing candle light in filigreed hurricane lanterns. The reception was covered by wisps of streaming tent swags to give an airy feel to the celebration. 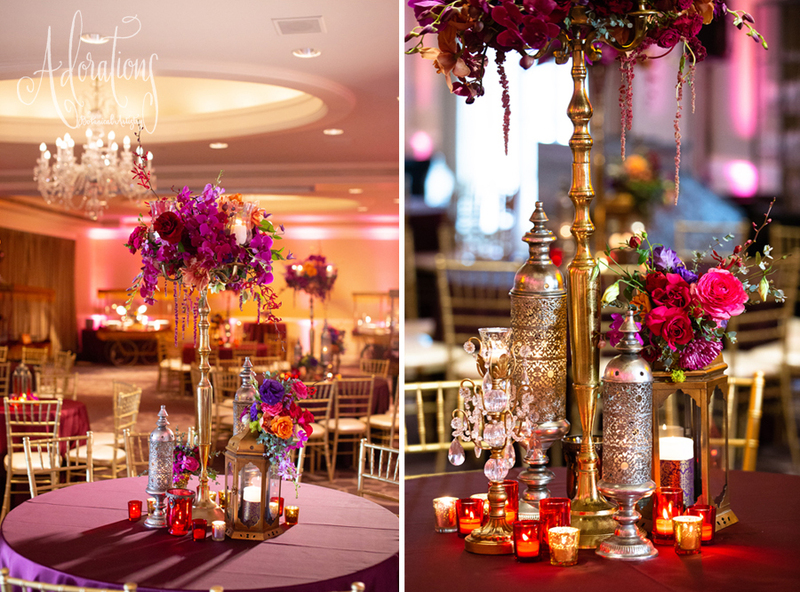 We strove ardently to get these beautiful photos from Marissa Holms Photography, because they so vividly capture the superb look and feel of this lovely affair which everyone worked so hard to accomplish. We truly consider it a stunning success, which we are proud to say became part of a four page spread of our work in the 2016 issue of Ceremony Magazine. Want more Pretty in Peony? Wedding Coorinator: Crown Weddings. Photography: Marissa Holmes. Venue: Rancho Valencia. Linens: La Tavola Linens. Tent: Classic Party Rentals. Cake: Hey There Cupcake. Officiant: Scott Milnes. Hair: and Makeup: A New Twist. Dj: Dashing Events. Guitarist: Kurt Hunter.Video: XOXO Video. Stationary: Brightly Designed. Photography: lunaphoto. Gowns: BHLDN. Floral Design & Bouquets: Adorations Botanical Artistry. Cakes & Sweets: Sweet Cheeks Baking Company. Calligraphy & Wedding Stationery: Dear Darling. Location: Anthropologie, UTC La Jolla. ADORATIONS CELEBRATES THE HOLIDAYS IN JULY! Summer is officially here! And while we relax and vacation with family and friends, it is never too early to start planning for your holiday or festive get-togethers happening later this year! Adorations can’t help but think ahead at all the amazing dates still in store for us in 2015 – from winter weddings to Thanksgiving feasts, Christmas parties and of course, ringing in the New Year. This is actually our very favorite season, when we can celebrate those celebrations to come! For the entire month of July, Adorations is gifting a special offer just for you! When you book during the month of July receive 15% off your total order for any social or corporate gathering taking place between September 1 - December 31, 2015! And as an added bonus present, client orders over $2,500 will receive a complimentary holiday arrangement of their choice to be delivered anywhere in San Diego county within the 2016 year. We just LOVE celebrating in July! Contact us today to discuss your upcoming corporate event, anniversary party, or holiday merriment! Adorations Botanical Artistry is your go-to floral and event design studio for all of your very special occasions! Sonya Sparks always knew she wanted to be involved in the arts and remembers drawing, painting and taking photographs at a very young age. By college, she studied Art at the University of San Diego but decided to major in Business Administration instead, as the art scene in SD wasn’t very open to new hires. After eight years at an international business, Sonya felt it was time to start something new. And so it began that this young lady (and former Adorations’ bride) started a namesake gallery right in the heart of downtown San Diego. The Sparks Gallery is home for contemporary artwork from artists living in San Diego and encourages patronage of local artists, while supporting San Diego's growth as a strong art community. Located in the historic Sterling Hardware Building on Sixth Avenue between Island and Market in the Gaslamp Quarter, the historic focus of the building aims to pair old San Diego with new contemporary visions. I was thrilled to provide flowers for the opening night of the Sparks Gallery for their debut group show, ONE ON ONE. Being that Sonya is one of my past brides, I was in complete awe to see her passion come to life in such a gorgeous and unique space. The opening was buzzing with an energetic crowd of hipsters, art enthusiasts, patrons, featured artists and fellow creators hoping to see their work showcased at Sparks Gallery one day. For me, I also felt like I was on display as our signature Adorations floral arrangement of seasonal blooms was part of the bar setup with smaller garden centerpieces set amongst the lounge tables. We choose flowers in various bright colors for the POP ART effect of our palette. As a wedding industry professional, I fell in love with the grandeur of the historic Sterling Hardware building and the amount of work that went into restoring such an amazing space. The original floors and brick walls were restored by hand to create an elegant balance between industrial and handcrafted detail work, and they designed the space so the fixtures, knobs, paint colors, and other details are all vintage (from 1924 or earlier) to fit with the era of the historic building. Apparently this building’s past included a vaudeville theater with a trapeze lady, carriage repair shop and a hardware store, while its inevitable that its future home will include many stunning events, as Sparks Gallery is available for wedding and event rentals. Sonya explained that they recently added industrial steel columns and seismic bracing to their building, so our capacity limit was raised from 50 people in 2012 (before renovations to the space) to 348 people this year. They’ve also added a whole new upper level mezzanine and interior structure with a kitchen, restrooms, office, and elevator lift to the second floor. While the main focus of Sparks Gallery will always remain to exhibit local San Diego artists, it’s possible they may consider expanding to national or global artists in the future but with several group and solo shows coming up this year along with the creation of a guest curatorial program for local curators, Sparks Gallery is already flourishing with a new show going up every month. They are also looking forward to hosting occasional seminars and other performance-based events, such as music or spoken word. Announcements for all these shows will be posted via social media and through their email newsletter. As for Adorations, we are so excited to have the Sparks Gallery just walking distance from our studio for inspiration as well as having the opportunity to contribute flowers for their upcoming events. Photography provided by Sparks Gallery. Cocktails: Snake Oil Cocktails. Architect: Hanna Gabriel Wells. Restoration Contractor: Wilson Construction.